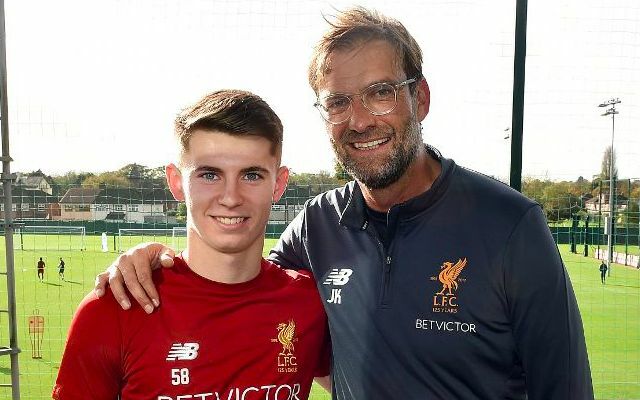 Ben Woodburn returned to Merseyside on Sunday to feature for Liverpool’s U23s in their Premier League 2 clash with Derby County. The Welshman, who is currently on loan at Sheffield United, started at the Academy as Neil Critchley’s men slipped to a 3-2 defeat. Woodburn hasn’t been recalled from his spell with the Blades, but was given the opportunity to gain some much-needed match fitness having not been involved for his temporary employers in Saturday’s Championship defeat to Derby. Liverpool went ahead early in the game when captain Matty Virtue met Adam Lewis’ low cross to finish off an excellent team move. Woodburn himself had played a role in the opener, combining with Lewis to find the left-back’s bursting run with a clever one-two. The visitors turned things around after the interval through goals from Calum MacDonald and Jacob Butterfield, before midfielder Isaac Christie-Davies brought Liverpool level with a superb curling effort into the top corner. Derby found time for a late winner when Louie Sibley poked home from close range. Woodburn has made just one start for Chris Wilder’s side since joining the club in the summer in search of his first taste of regular senior football. The 19-year-old hasn’t been involved in the last five Championship games, with minutes proving difficult to come by in a team that has risen to second in the league across an outstanding run of form. Though Liverpool will ideally be hoping to see Woodburn’s gain more game time, there is an evident caution over rushing him in too quickly. Wilder has seemingly built on Klopp’s approach with the teenager by easing him in and granting him the added time to adapt to a change in intensity and physicality.